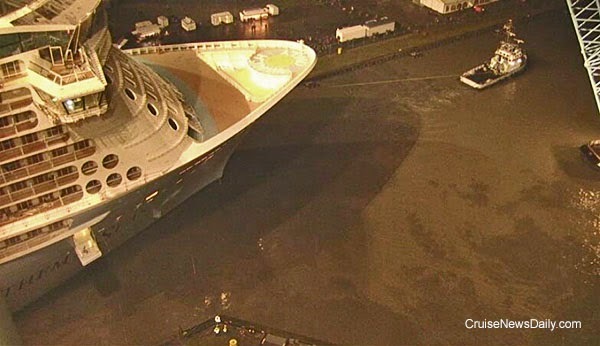 After another delay today, Meyer Werft was finally able to tow Royal Caribbean's Anthem of the Seas out of the building dock beginning at about 7:30pm (local time, 1:30pm eastern time in the US). The delays were caused by high winds and rain, causing the operation to be conducted under night lighting in the lagoon because the procedure got started so late on Saturday. The ship will remain at the Papenburg (Germany) yard for approximately the next month while details and the interior are completed. The funnel will be attached tonight, and the arm for the Northstar observation platform will be attached tomorrow. The ship will also move away from the outdoor berth at the Meyer Yard for thruster and stabilizer tests on Sunday. Update 6:30 am ET - Meyer says they now expect to begin towing Anthem out of the building dock at 4pm to 5pm LT - 10am to 11am ET. Weather conditions again kept Meyer Werft from floating out Anthem of the Seas this afternoon in Germany. The new plan is to try Saturday (February 21) afternoon (7:00am eastern time in the US). 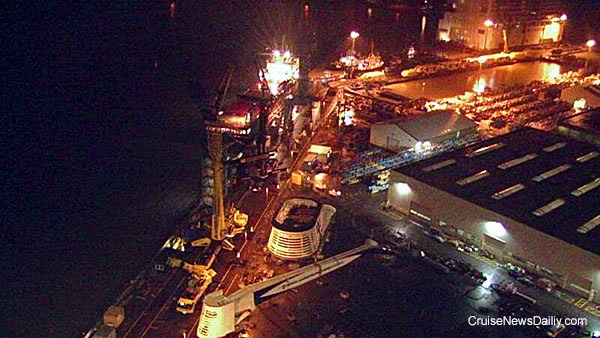 In this photo taken of Meyer's outfitting pier on Friday night, you see the empty berth, the stack and the Northstar arm which will be attached to the ship on Sunday. Details appeared in the February 20 edition of Cruise News Daily. This isn’t going to apply to most of our readers, but nonetheless, it is an intriguing program. The Inner Island program is only open to young people from 18 to 25 years of age in France, Germany, Italy and Spain. The Inner Island social media app allows participants to design their perfect cruise product. Players will be able to submit their ideas about four key aspects of cruising: destinations, food & beverages, entertainment and sport & wellness. The complete story appeared in the February 20 edition of Cruise News Daily. MIAMI, Feb. 20, 2015 -- Mark Tamis has been named senior vice president, Hotel Operations for Royal Caribbean International. Tamis will further the global cruise line's commitment to deliver outstanding vacations to almost four million guests per year. He will have oversight of the line's hotel services, food, beverage, entertainment and private destinations, and will report directly to Michael Bayley, president and CEO of Royal Caribbean International. "Mark has extensive knowledge and a proven track record of success in the hospitality industry and I look forward to welcoming him to the Royal family," said Bayley. "In his role, Mark will lead the dedicated men and women who work every day to deliver the best vacation adventures to our guests from around the world. And I am confident that he can help us take our award-winning experience to even greater heights." A 25-year travel industry veteran, Tamis most recently served as senior vice president, Guest Operations with Carnival Cruise Lines. Prior to that, Tamis was the chief operating officer of The Setai Hotels and Resorts. He also held a variety of management positions with hotel organization, Ian Schrager Company. Tamis began his career with Four Seasons Hotels after earning a Bachelor of Science degree at Cornell University, School of Hotel Administration. He is active in various civic and community service organizations including Big Brothers Big Sisters and Special Olympics, and founded www.dadsforgiving.org, an organization that encourages fathers to volunteer with their children to benefit their communities. New Orleans has scored another ship homeported there, albeit a small one. American Cruise Line’s new riverboat, American Eagle, will homeport at the Crescent City for various itineraries primarily on the Lower Mississippi between New Orleans and Memphis. Rendering courtesy of American Cruise Line. All rights reserved. May not be copied or used without permission. Update: Friday noon ET: Due to weather conditions, the float out has now been rescheduled for Saturday afternoon (German time), 7am eastern time in the US. Earlier this week we told you that Meyer Werft was planning to float out Anthem of the Seas and webcast it early Saturday morning. Not now. Because of predicted windy weather on Saturday, the yard has decided to move up the operation to Friday afternoon (in Germany) at 3:00pm. That’s 9:00am Friday morning (February 20) eastern time in the US. 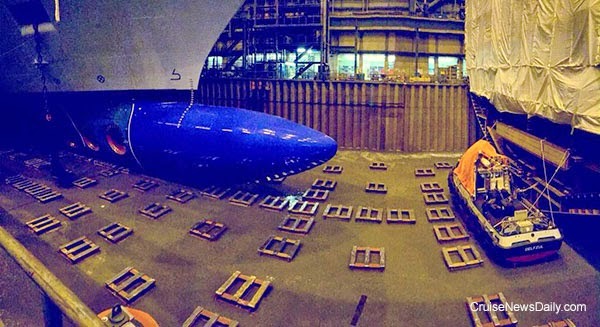 The photo below shows Anthem of the Seas in Meyer's covered building dock 2 today, awaiting floating up. Note the tugboat to the right of the photo. It has been lifted around the ship and placed in the dry dock so tomorrow it will be positioned at the ship's bow to assist during the float out. Details appeared in the February 19 edition of Cruise News Daily. Photo courtesy of Meyer Werft. All rights reserved. May not be canceled or used without permission. 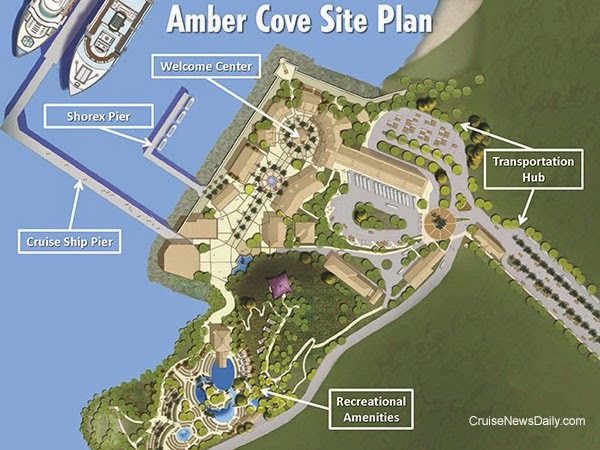 Earlier, Carnival Cruise Line released schedules of their brand’s calls at Amber Cove, Carnival Corp’s new port being built on the north coast of the Dominican Republic. But the company now says that five of their other brands have also scheduled calls at the new port during the 2015-2016 inaugural season. In addition to Carnival, AIDA, Costa, Cunard, Holland America, and P&O Cruises (UK) have added calls at the private facility. 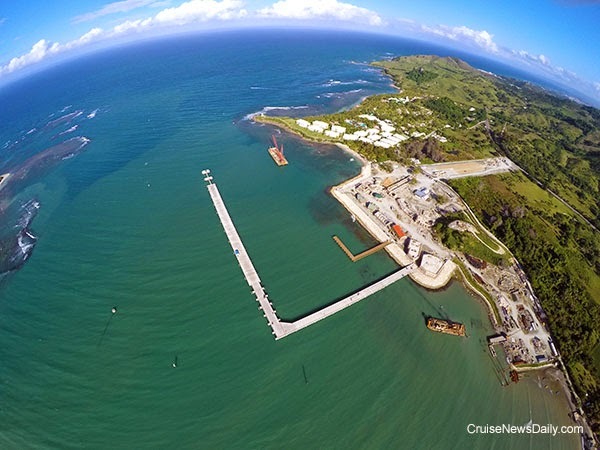 The complete story appeared in the February 18 edition of Cruise News Daily. Carnival is using drones to photograph construction progress at Amber Cove. This photo is an example. Photos courtesy of Carnival Corp. All rights reserved. May not be copied or used without permission. Meyer Turku (formerly STX Finland) has informed TUI Cruises they will deliver Mein Schiff 4 early. TUI has taken the opportunity to schedule two extra cruises. Details appeared in the February 18 edition of Cruise News Daily. With the rise of cooking shows on TV (both “how to” and competitions) and Foodie-ism in general, P&O Cruises is striking while the iron is hot. When Britannia debuts next month, The Cookery Club (cooking school to those of you on the west side of the Atlantic) will be open for business. This is taking the show kitchen and cooking demonstrations up a couple of levels. Not only will you be able to take cooking lessons, but quite often it will be with a very well known chef. Details appeared in the February 17 edition of Cruise News Daily. A couple years ago Carnival Cruise Line had become the punch line to every joke on late night tv, including having the honor of an entire Saturday Night Live skit about them. They had a couple of disabled ships that garnered mega media coverage. They had their share of norovirus incidents, and add in the halo effect from the Costa Concordia accident. The Carnival brand was riding pretty low in the water. Fast forward to this year. Carnival is ecstatic because YouGov’s BrandIndex Buzz Rankings Report, which evaluates consumer perceptions of companies across multiple categories, ranks Carnival as the most improved US brand in consumer perception. It hardly seems possible that a sister to Quantum of the Seas could be nearing completion already, but it is. 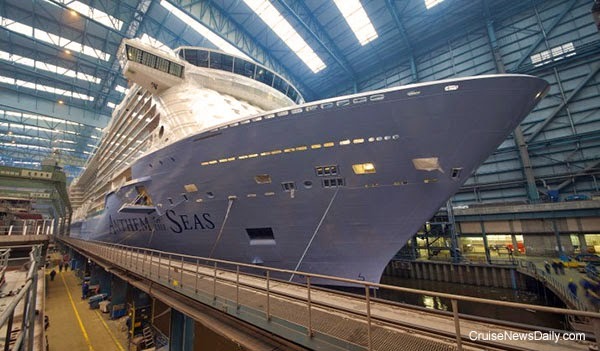 Meyer Werft has scheduled Anthem of the Seas to float out of the covered building dock early on Saturday (February 21) morning (in Germany). Sunday was a history-making day at Port Canaveral. It was the first time the cruise port had ever hosted six large ships at once.